Partially remove the front fender protector (rh). Refer to ext-28, "fender protector : removal and installation - front fender protector". 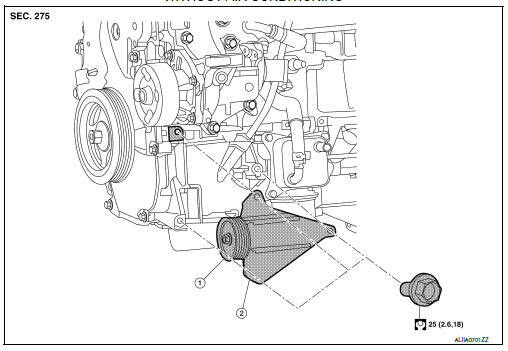 Remove the drive belt from the compressor. Refer to EM-15, "Removal and Installation". Complete removal of the drive belt is not necessary. Cap or wrap the joint of the a/c pipes with suitable material such as vinyl tape to avoid the entry of air. Disconnect the harness connector from the compressor. Remove the compressor bolts and the compressor. Do not reuse the o-rings. Apply a/c compressor oil to the new o-rings for installation. After charging the a/c refrigerant, check for leaks. Refer to ha-21, "leak test". Tighten the compressor bolts to the specified torque. Refer to HA-30, "Exploded View". Remove the center bolt by holding the clutch disc steady using the clutch disc holding tool. Remove the clutch disc and shim(s). Remove the snap ring using external snap ring pliers. 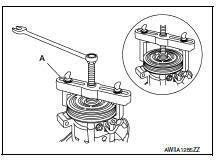 Remove the pulley assembly using suitable tool (a). To prevent deformation of the pulley groove, the puller claws should be hooked under (not into) the pulley groove. Remove the magnet coil snap ring (a) using a suitable tool. Then remove the magnet coil (1) from compressor shaft. If the contact surface shows signs of damage due to excessive heat, replace clutch disc and pulley. Check the appearance of the pulley assembly. If the contact surface of the pulley shows signs of excessive grooving, replace the clutch disc and pulley. The contact surfaces of the pulley assembly should be cleaned with a suitable solvent before installation. Check the magnet coil for a loose connection or cracked insulation. Be sure to align the magnet coil pin with the hole in the compressor front head. Install the magnet coil (1) on the compressor shaft with the snap ring (A) using suitable tool. Install the pulley assembly using the drive plate installer and a wrench, then install the snap ring using snap ring pliers. Install the clutch disc on the drive shaft, together with the original shim(s). Press the clutch disc down using the drive plate installer. Install the center bolt using the clutch disc holding tool. After installation, check that the pulley rotates smoothly. Install the compressor. Refer to HA-31, "COMPRESSOR : Removal and Installation". Check the clearance around the entire periphery of the clutch disc. If specified clearance is not obtained, replace compressor clutch. When replacing compressor clutch assembly, always conduct the break-in operation. This is done by engaging and disengaging the clutch about 30 times. Break-in operation raises the level of transmitted torque.